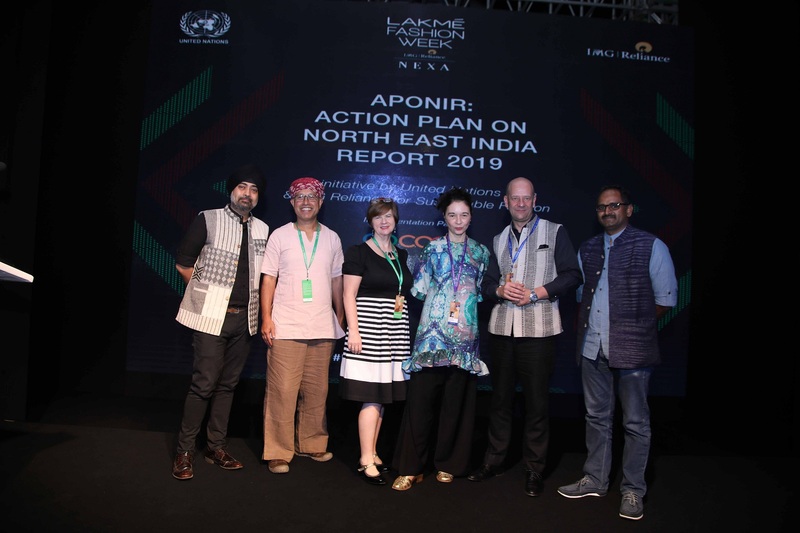 Lakme Fashion Week and IMG Reliance in collaboration with the United Nations in India hosted an action-oriented dialogue on the Northeast Region (NER). The dialogue opened the Sustainable Fashion Day and was followed by a curated show featuring six sustainable fashion designers from six Northeast states. The collaboration with the United Nations in India aims to boost the local sustainable economy of the NER. The event showcased the exciting potential of the region to mainstream stakeholders, including brands and designers, highlighting the mutual benefits of doing business in the northeast. The six featured designers tapped into a rich tradition of textiles to emphasize the vast possibilities of the region if proper supply chain frameworks are in place. As stressed on by the designers, the North East handloom industry is hindered by difficult terrain, which delays the supply of yarn to weavers. Loin looms, which produce cloth of a narrow width, are still popular, limiting the utility of the cloth. Yet, the North Eastern Region has the highest concentration of handlooms in the country. To address some of these issues, the UN in India, IMG Reliance and GoCoop announced the launch of the Action Plan on North East India Report, a first-of-its-kind attempt to provide a comprehensive overview of the challenges and opportunities in the region for the fashion and lifestyle industry. The report will assess the current and future demand for handloom products from North East and, most significantly, recommend a strategy for developing supply chains and marketing channels for North East handloom organizations and artisans. Its goal is to be a repository of not only the challenges faced by the sector in the North East but also for sustainable solutions to these challenges. It also aims to provide a framework for policy interventions by government. The partners will engage different stakeholders, from the government to industry and handloom workers, in order to devise and test pilot-based interventions by mainstream industry players. Several leading champions doing transformational work in sustainability were part of this very informative and interesting dialogue that was led by Yuri Afanasiev, Resident Coordinator, United Nations in India. Orsola De Castro, Founder and Creative Director of Fashion Revolution in UK, a global movement that works towards a more sustainable and environmentally friendly fashion industry, campaigning for a systemic reform with a special focus on the need for transparency in the fashion supply chain. She spoke about the launch of a special initiative focused on the NER in collaboration with the British Council and IMG Reliance. Osama Manzar, the Founder of Digital Empowerment Foundation, which aims to eradicate information poverty from India and the global South using digital tools, spoke about a digital cluster development programme; focused on the NER led by the foundation in the coming year. 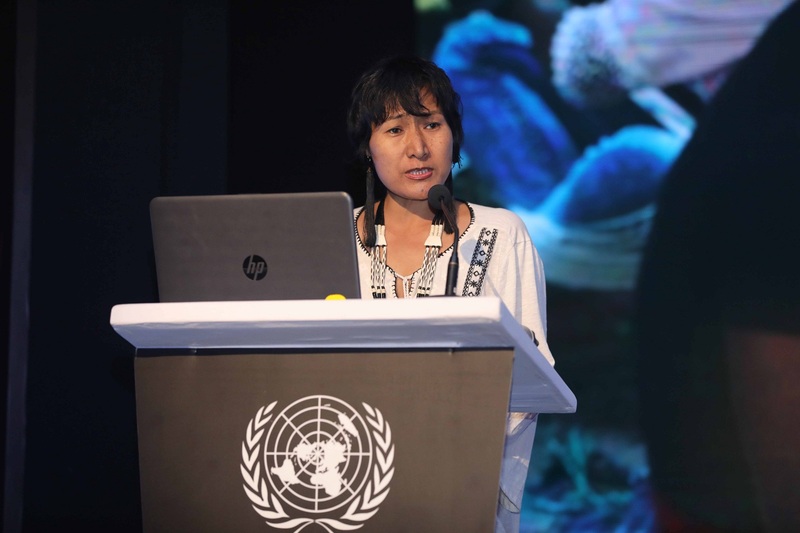 Siva Devi Reddy, Founder of Gocoop, India’s first online global marketplace, which enables handloom cooperatives and artisans to connect directly with consumers spoke about the Gocoop’s planned initiatives to spur development of handloom clusters in the NER. Sonnie Kath, Founder of Exotic Echo Society in Nagaland represented Northeast artisans who showcased their textiles in collaboration with fashion designer JenjumGadi at Lakmé Fashion Week Summer/Resort 2018. 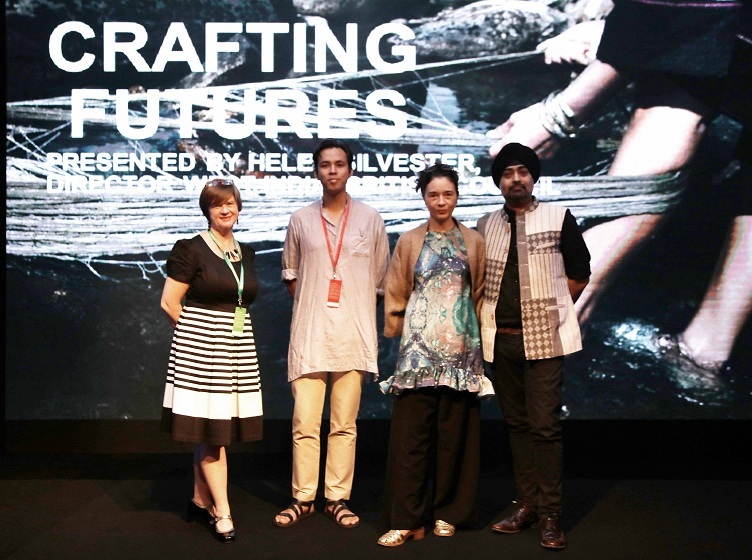 The British Council’s global ‘Crafting Futures’ programme will be coming to India in collaboration with IMG Reliance and Fashion Revolution, an organization that celebrates fashion as a positive influence, while also scrutinising industry practices and raising awareness of the most pressing issues facing the fashion industry. This collaboration will bring an international designer and Indian designer Aratrik Dev Varman of the label Tilla together to explore new fashion systems and approaches with female textile artisans in the NER. The aim is to grow their livelihoods and economic opportunities through responding to a creative brief set by Fashion Revolution. Works in progress will be presented at the August 2018 Lakmé Fashion Week, and final work will be presented at the February 2019 Lakmé Fashion Week before appearing in Fashion Revolution’s biannual fanzine. The work will showcase female textile artisans in India and demonstrate how design innovation can promote a fairer, more inclusive fashion industry. The creative brief toolkit will become available publicly and for schools, allowing young activists, designers, students and practitioners to experiment with new design-based interventions to create innovation themselves. 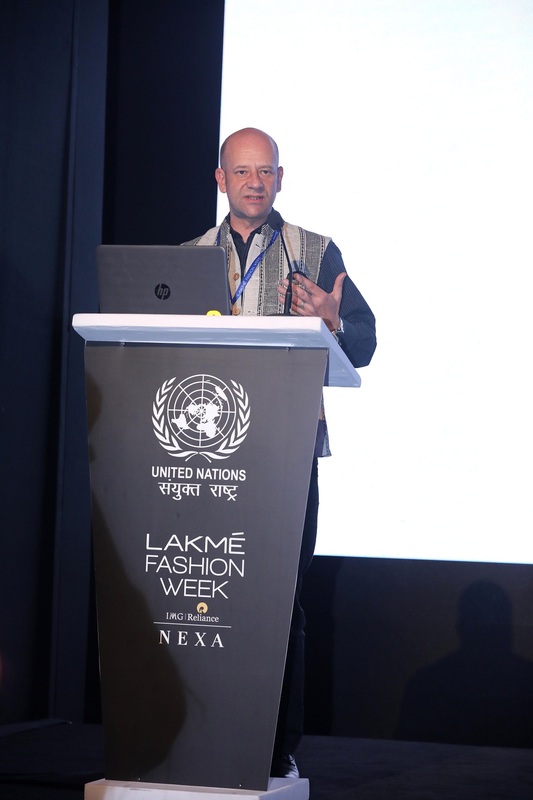 Alan Gemmell, OBE, Director India, British Council, commented, “We are delighted to continue our partnership with Lakmé Fashion Week and IMG Reliance – two of India’s world-leading brands – and to work together to support the development of a sustainable fashion industry in India. The keynote speaker for this workshop was Huey the UN representative for India and was moderated by Gautam Vazirani from IMG Reliance. Huey further highlighted the importance of change within the textile industry and showcased the vest he was wearing which was made by a designer from Nagaland and discussed the concept of establishing supply chains for the artisans who often get overlooked and simply categorised as producers. The workshop introduction also included a video message by ShrimatiSmriti Irani who explained the core of the workshop – from discussing the economic and ecological protection of raw materials, sustainable development of India, international fashion opportunities and women’s empowerment through Indian art and craftsmanship. A number of designers like Sonal, Sonika, Richard, Daniel Siam, Osama Manzir, all of whom work with the traditional mediums from their respective states also shared their experiences – highlighting the positive and as well as difficult experiences they had working with traditional mediums, though ultimately they placed further value and importance on how to revive an art form which has been passed down from generation to generation. The topics all stressed on the importance of encouraging the authentic cultural identity of Indian artisans, rather than simply using their fabric for western concepts. A slideshow on the similarities between cultures was displayed, to elucidate the very core of travel-trade between tribes, countries and various lands which have been part of our culture for centuries. With the interest in Indian textiles from International segments growing, the workshop also included a few internationally well-known fashion figures. Orsola de Castro, co-founder of Fashion Revolution took the stage and explained the need to hold designers accountable for their labels thus in turn encouraging them to improve and honour those who make their clothes. She also voiced the need to highlight the accent trade of fabric which represents the movement of mankind set in stories, that were woven into colours and textiles. Helen Silvester, the Director of West India, British Council, put forth the idea of including a specialised initiative for female textile producers in India to achieve gender equality. The workshop also introduced Gocoop, a multi-lingual app by (name) created to link traditional artisans directly with their market to sell in a bid to reinforce fair trade and connect producers to better markets. Part of Gocoop’s ethos is to educate traditional designers by teaching them newer forms of production which includes working with computer aided design, market research, sourcing raw materials, finding better alternatives to materials that are sustainable, quality check protocol and marketing themselves. The workshop ended with Mr. Jaspreet from IMG Reliance announcing Aponir – Action Plan on North East India Report 2019, an initiative launched by the UN and IMG reliance that plans to study markets and raise the bar for the traditional textile industry.